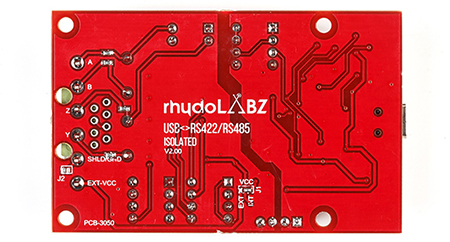 USB to RS485/RS422 board with isolation is a new product from rhydoLABZ. It is suitable for most applications including industrial, commercial and any general office computer device. It is a bi-directional (meaning it communicates in both directions), reliable and cost-effective converter that easily lets you to connect any RS-485 or RS-422 device directly to your computer’s USB port, efficiently converting USB signals to half-duplex RS-485 or full-duplex RS-422 and vice versa. 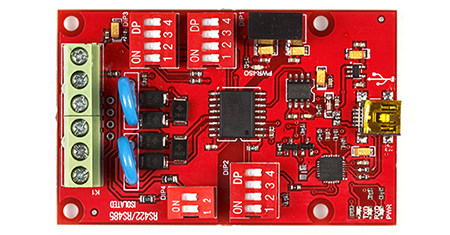 We can connect the board directly to USB of PC and select the communication mode using DIP switch on the board. This board is manufactured with Automatic Pick and Place Machine for high quality standard. The shield itself is high quality PTH PCB with professionally designed circuitry. The J1 jumper allows you to select power supply (external power (5V) or internal power (USB itself)). We have also considered optional customization as per users convenience, for which the design includes onboard PCB jumpers and DIP switches. Adjustable Pull-up, Pull-down and terminating resistor. Onboard mini USB to powerup the module. J1 jumper to select External (5V) or USB power to be used.